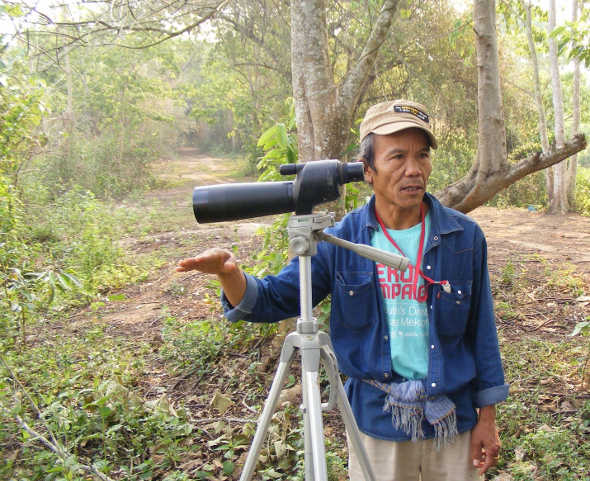 Mr. Chak Kineesee, Program and Outreach Director at the Mekong School for Local Knowledge. ‘This is my home and these are my people,’ says Mr. Chak Kineessee as he guides us on a longboat ride up the river. 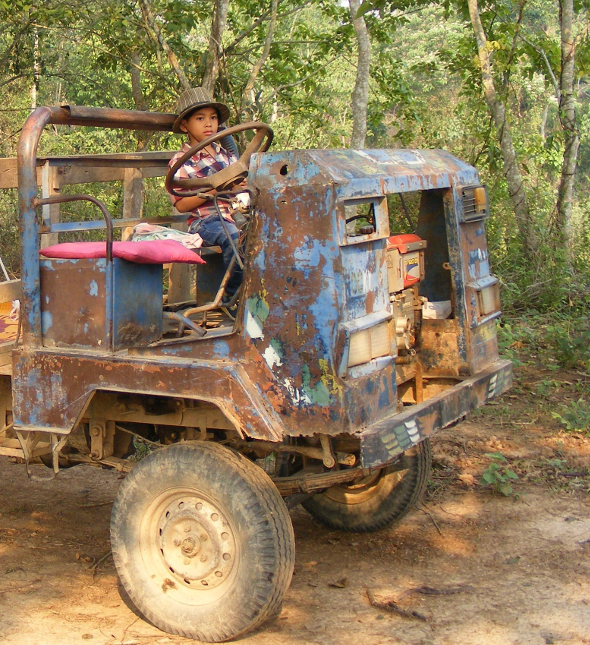 Mr. Chak was born in a village east of the Mekong River and is a member of one of the Hill Tribes of Northern Thailand. He works to protect the river and the livelihoods of the local indigenous people. Mr. Chak gave me a tour of one of the village forestry programs as well as a longboat ride up the Mekong River. 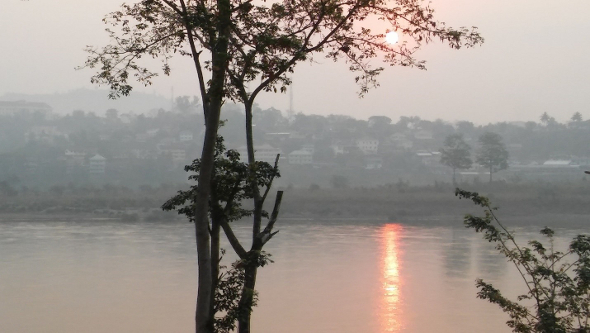 Dawn breaks hot and smoky on the Mekong River in Chiang Khong, Thailand on 11 April 2016. Looking across the river to the neighbouring Laos town of Huay Xai, the sun eases above the hills amidst intense haze and humidity. April is the hottest month in Thailand, and April 2016 was the hottest month in 65 years, breaking 100 degrees Fahrenheit every day in the entire month. The dawn smoke is from slash-and-burn agriculture that is causing havoc on the forests on the Laos side of the border and throughout northern Thailand. We start our day by meeting at the Mekong School for Local Knowledge which sits along the banks of the Mekong River in the small town of Chiang Khong in the very north of Thailand several kilometers downstream from the Golden Triangle where Burma, Thailand, and Laos meet on the river. The School is a very small NGO and a grantee of Global Greengrants Fund (GGF) and GGF’s partner International Rivers. The School uses the phrase ‘local knowledge’ in the same way that we think of ‘indigenous knowledge’ – that which has developed naturally as a part of the lives of native peoples. China has built several dams upstream on the river that impact the lives of downstream residents here in Chiang Khong. 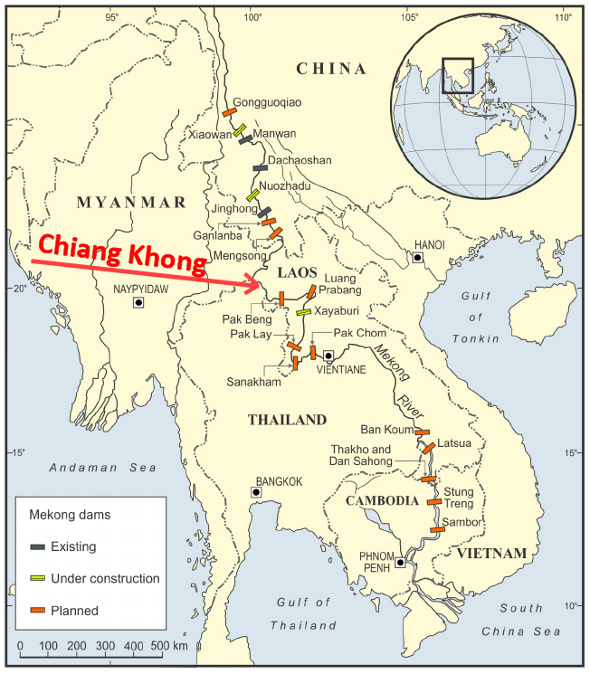 Many more dams are proposed on the Mekong River in China, down through Thailand, and downstream through Viet Nam and Cambodia. The river – and the local indigenous people and their livelihood – is severely threatened by dams that change the flow of water, drown fish and bird habitat, drown villages and displace people, and submerge and erase local centuries-old knowledge of how to live sustainably on the landscape. 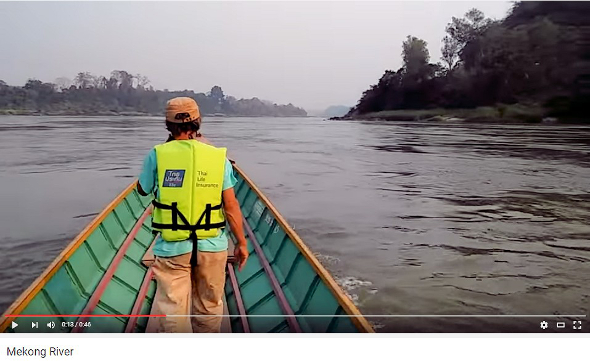 We visited in April during the dry season and first took a tour of the nearby forest preserve and the Ing River – which is a very small tributary to the Mekong River a few kilometers southeast of Chiang Khong – where local people fish and gather food. Where Mr. Chak is standing right now would be under two meters of water when it floods in the wet season. But here’s the problem – the upstream Chinese dams hold back some of the water and divert it out during the wet season, and so the floods no longer occur as high and often as they did in the past. The landscape – and the local peoples’ livelihood – have irrevocably changed. Birds don’t have as much nesting habitat. Fish can’t spawn as readily as they did before the dams. Local people can’t gather the forage, crops, and fish from the native landscape as much as in the past. Mrs. Yod La is a member of the Dai Yaun tribe which is the oldest Hill Tribe in the area. She joined us on our tour of the forest preserve near the Ing River. 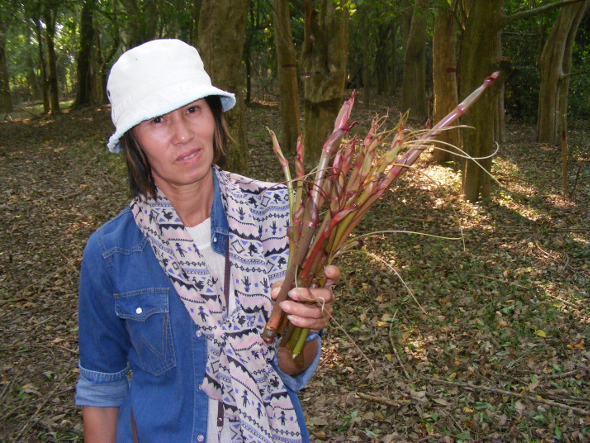 While we walked and drove through the forest, she harvested wild vegetables from the forest floor. If the forest no longer floods because of the upstream dams, the food will no longer grow during the dry season. Mrs. Yod La’s son, Sam, joined us on our visit to the forest as a passenger in the farm truck. Their family lives on the farm beside the Ing River along with 400 villagers. The Ing River is important spawning habitat for Mekong River fish, and parts of the river are a fish sanctuary that the locals call a ‘fish palace.’ The government has threatened to cut down the forest around the river and use the land for rice farming. In the afternoon, we come back to the Mekong School to visit and look at their maps and literature before we jump in the longboat to tour the Mekong River. 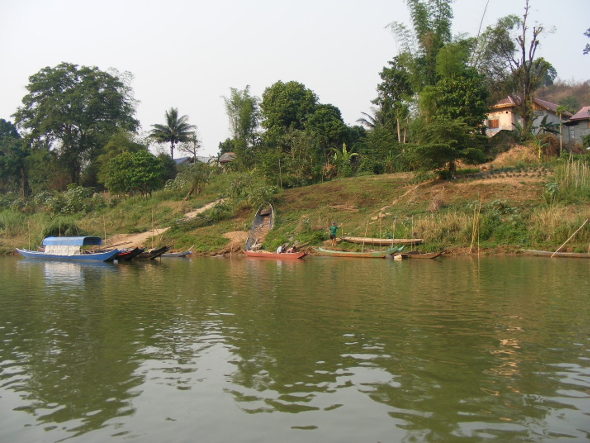 The School undertakes research about the river and all of its aquatic life and ecology as well as the ways that local people use the river for their livelihood. The research collected by the school is used to inform decision makers in the government about why the Mekong River should be protected and why the local tribal people should be able to stay on their land near the river. 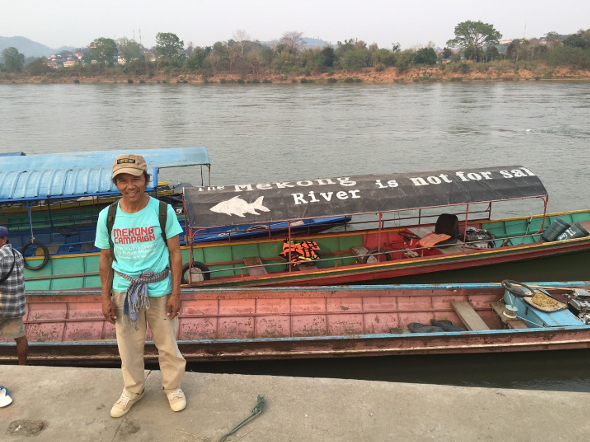 The school’s 20 meter longboat boasts its credentials on the canopy – ‘The Mekong River is not for sale!’ Mr. Chak’s hat echoes the same river-saving sentiment. 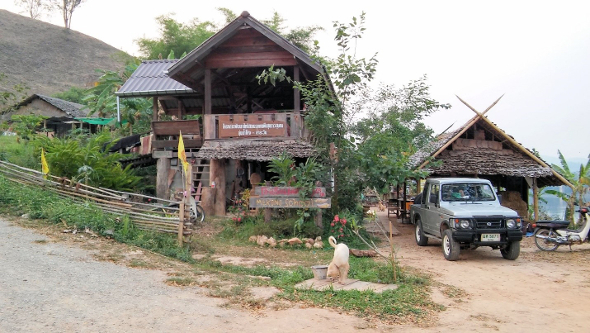 The river is the centre of the culture for tribal people as well as for the more modern culture that is encroaching on the Hill Tribe areas of Northern Thailand. Mr. Chak and his group believe that the Mekong River should be for nature and people, not ‘for sale’ to the highest bidders in business. The Mekong River is used for transportation – crops and food travel up and down the river by longboat. Some of these boats have large inboard motors that run on propane; others have outboard motor with spinning propellers at the end of 10-foot long shafts. The river bursts with the noise of boat traffic, fisherman, and even local students hollering out commands as they row crew. A small fish encampment on the Laos side of the river sits idle in the late afternoon as most of the fishing is done in the morning along the Mekong River. 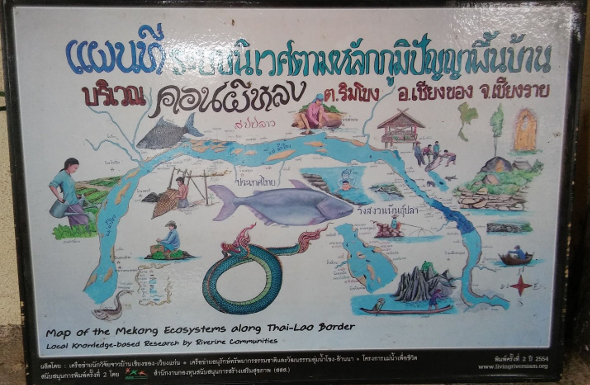 The Mekong School for Local Knowledge focuses heavily on research about the fish, their habitat, and the ways of the fishermen along the river. By understanding the local knowledge, the school can influence decisions about the future of the river and help protect it from more dams. For example, the School has researched 93 fish species in the Mekong River, 83 of which are native, 10 non-native. Thirteen of the Mekong’s fish are officially ‘endangered’ including the world famous ‘Giant Catfish’ which can grow to over 200 kilograms. The operation of the Chinese dams upstream cause the river to be too cold, clear, and deep in the dry season because they run the water out through the hydroelectric turbines at a steady and unnatural rate in order to generate electricity. This, in turn, has led to the endangerment of some of the fish. The Mekong River is under siege by more proposed dams. Large political disputes in all of the countries across the Mekong River’s watershed underscore the significance of the river to this section of Southeast Asia. Governments have formed the ‘Mekong River Commission’ to try and address the disputes. NGOs throughout the six-country region have alternatively formed the ‘Save the Mekong Coalition’ to protect the river from dams. If all of the dams are built, the river will be devastated, along with the local people’s livelihood and the fish, bird, and aquatic species that depend on the river for survival. 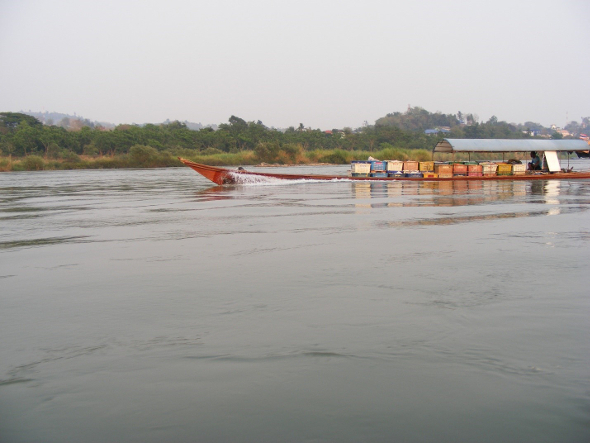 In recent years, the Chinese government traveled by boat down to this section of the Mekong River near Chiang Khong in Thailand and attempted to blast the rocks out of the river to make it easier for ships to navigate its waters. 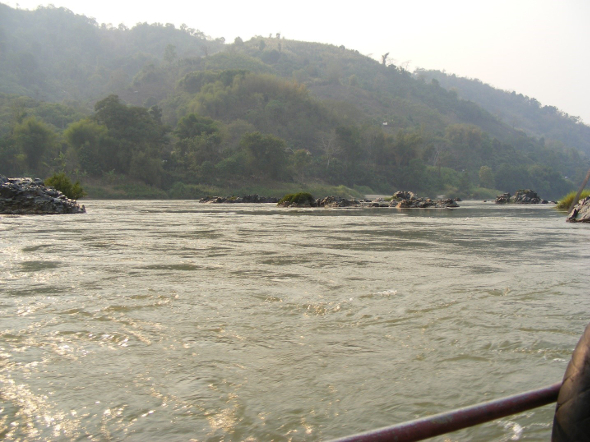 The Mekong School for Local Knowledge has opposed the blasting – the rocks and rapids in the river are important bird-nesting and fish-spawning habitat. ‘We are the children of the Mekong River,’ says Mr. Niwat Roykaew who is the Director of the Mekong School for Local Knowledge. 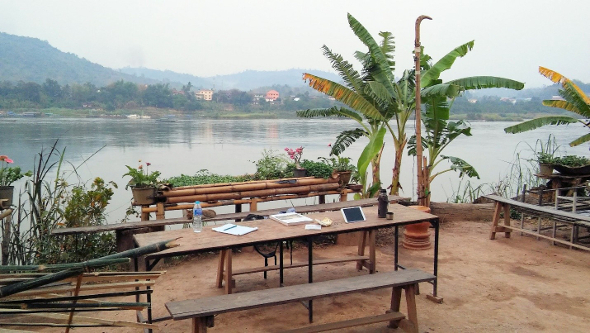 This is Mr. Niwat’s desk – and also serves as the Mekong School’s lunch table – on the banks of the river. Mr. Niwat sees the main threats to the river as dams, destruction of rocks and rapids, agricultural chemicals, garbage thrown into the river from ships, development in wetlands, and illegal fishing techniques like blasting and electro-shock. ‘When local people learn their history, they are empowered by that knowledge,’ Mr. Niwat says. 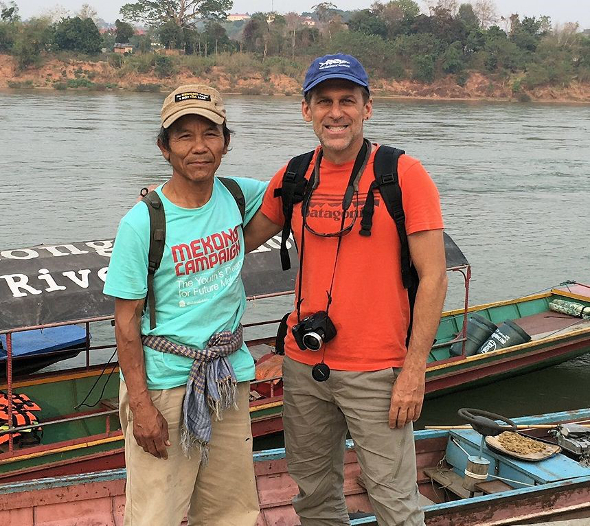 Researching all of the local history, relating that knowledge to decision makers, and teaching that history to members of the Hill Tribes is the work of the Mekong School for Local Knowledge under Mr. Niwat’s stewardship. 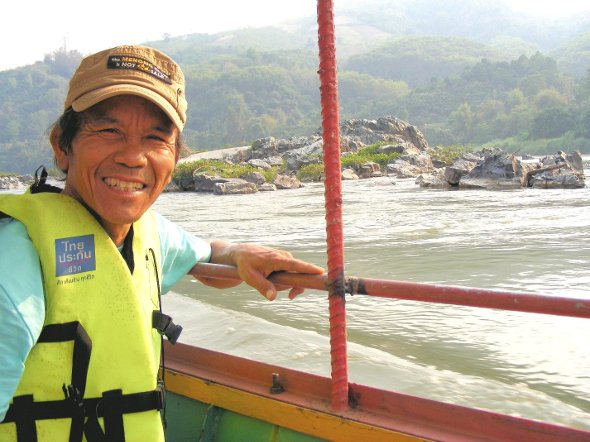 Mr. Niwat has served as an expert witness in Thai court, arguing for better protection of the river and the landscapes and people who live around it. 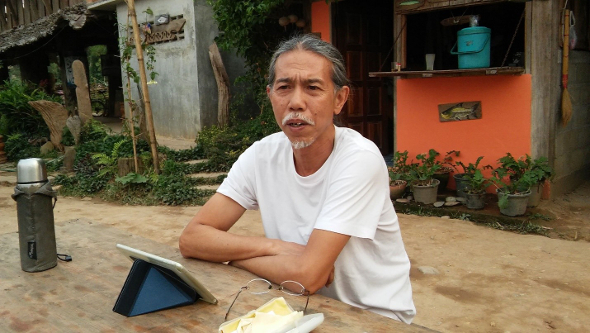 He is also frequently quoted in Southeast Asian newspapers as a key spokesperson for local and indigenous people fighting for their livelihoods along the river. What is it like to ride a longboat down the Mekong River? Click to view the YouTube video. Chak Kineessee, left; Gary Wockner, right. Gary Wockner, the author of this photo-essay, is an international environmental activist, writer, and consultant/volunteer for Global Greengrants Fund and International Rivers.